MOSCOW (Reuters) - Russian President Vladimir Putin on Thursday threw his weight behind a presidential bid by Egyptian Army chief Field Marshal Abdel Fattah al-Sisi, voicing hope that ties would strengthen after the election. Russia is looking to take advantage of strains between Cairo and Washington, which has withheld some of its annual aid to Egypt after Sisi ousted Egypt's first democratically elected president Islamist leader Mohamed Mursi last year. Sisi, 59, has been urged to run by members of the public who reject the Islamist government he toppled, and by members of the armed forces who want a president who can face down growing political violence. Earlier this month, a Kuwaiti newspaper quoted him as saying he would run in an election expected to be held in April. "I know you have decided to run for president. This is a very responsible decision, to take upon yourself responsibility for the fate of the Egyptian people," Putin told Sisi. "I wish you luck on my own behalf and that of the Russian people," he said. Foreign Minister Nabil Fahmy said last year that Egypt would look beyond Washington and keep its "options" open to meet its security needs. Russia is currently negotiating an arms contract with Egypt that Moscow-based defense think tank CAST has estimated at $2 billion. Moscow says it lost tens of billions of dollars in lost defense contracts after "Arab Spring" revolts toppled Moscow-friendly leaders in the Middle East and North Africa. Russian President Vladimir Putin said he supports a presidential bid by Egypt's top military commander, Field Marshal Abdel Fattah al-Sisi, who was in Moscow seeking to forge deeper military cooperation between the two countries. "I came to you with the open arms, Vovchick. Please, appoint me the President of Egypt!" "All right. But I'll see how you will behave. If you serve me well, I'll give you the Golden Star, just like to Nasser. But if you switch sides, like that other guy, you will be killed by my agents, remember this!" "Thank you for giving me the Big Red Star, Vovchick! Even if you keep me on a stretched arm distance for now." SOCHI, RUSSIA – Prime Minister Shinzo Abe said Saturday that Russian President Vladimir Putin will visit Japan in the fall, as the two countries try to resolve a territorial dispute that has prevented them from signing a peace treaty following World War II. The announcement came after the leaders met earlier in the day in Sochi, Russia, where Abe attended the opening ceremony of the Winter Olympics on Friday in the absence of U.S. and many European leaders in protest at Russia’s handling of human rights issues. “We agreed that President Putin will visit Japan this fall,” Abe said at a press conference following the meeting. Russia’s news agency Interfax reported that Putin’s visit is possible in October or November, citing the president’s representative. Abe and Putin agreed their countries should accelerate bilateral talks on the issue, Japanese officials said. Tokyo hopes the planned visit by Putin will help give momentum to the negotiations as the two sides remain unable to narrow their differences significantly despite repeated contacts over the past year. Abe also said he wants to hold talks with Putin in June, when Russia will host a summit of the Group of Eight nations in Sochi. The latest meeting in the Black Sea resort was their fifth in a year. Putin hailed the recent increase in trade between Japan and Russia. “We have seen a good environment be created that could help resolve the most difficult problem in bilateral relations,” he said at the beginning of the meeting, which was open to the press. He also expressed appreciation of Abe’s attendance at the opening of the Olympics. U.S. President Barack Obama and many European leaders did not attend the opening ceremony in protest at anti-gay legislation enacted by Russia last year. Abe’s visit apparently reflects his desire to enhance mutual trust with Putin. They also agreed to promote bilateral security dialogue and enhance comprehensive economic cooperation, including Japanese investment in developing the Russian Far East, where abundant oil and gas reserves have been confirmed. Abe and Putin have since met three times on the sidelines of international conferences, confirming their commitment to dialogue on necessary steps to address issues of bilateral concern. Japanese and Russian officials have engaged in talks to resolve the dispute over the islands, known as the Southern Kurils in Russia and the Northern Territories in Japan. Tokyo claims that Soviet forces continued an offensive against Japan after it surrendered in World War II, seizing control of all four islands from Aug. 28 to Sept. 5, 1945. In past bilateral talks, Japan has said if Russia acknowledges the four islands belong to Japan, Tokyo is prepared to respond flexibly on the timing and manner of their return, but Russia has shown no sign of recognizing Japanese ownership. Abe and Putin confirmed they will promote economic cooperation in both public and private sectors, the officials said. Japan and Russia are scheduled to hold a forum in March in Tokyo, where Russian economic ministers and business leaders will meet with their Japanese counterparts and discuss cooperation in the areas of agriculture, medical services, urban development and energy. On security, Abe conveyed to Putin his intention to pursue more strategic dialogue with Russia, apparently considering the situation in East Asia, where Tokyo faces threats such as North Korea’s nuclear and ballistic missile development programs, and China’s increasingly assertive maritime activities. Russia is a close ally of both China and North Korea. In November, Japan and Russia held for the first time the so-called two-plus-two meeting in Tokyo, in which their defense and foreign ministers agreed to expand joint exercises between their defense forces and advance cooperation in multilateral consultative frameworks covering security affairs in the Asia-Pacific region. 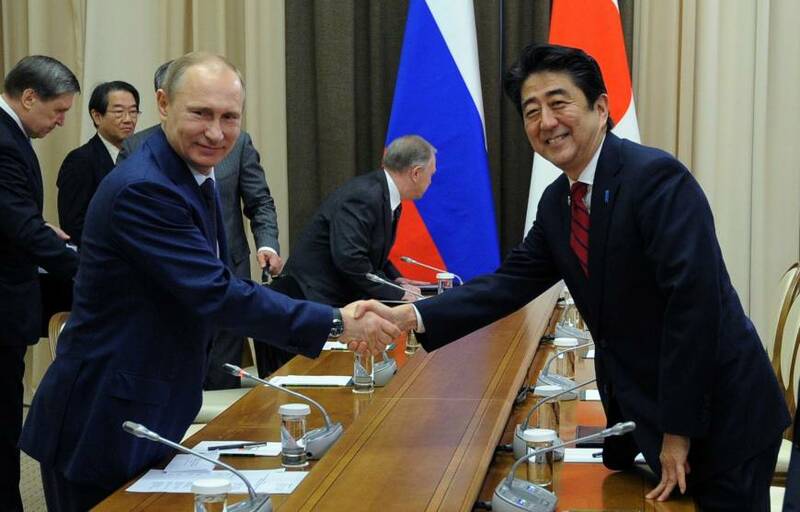 » Why is Japan's Abe Seeking Better Ties with Russia's Putin? Chinese naval soldiers stand guard on China's first aircraft carrier Liaoning, as it travels towards a military base in Sanya, Hainan province, in this undated picture made available on November 30, 2013. Ongoing tensions with the Philippines, Japan and other neighbours over disputed territories in East and South China Sea were heightened by China establishing a new airspace defense zone. "Admiral Samuel Locklear, head of the U.S. Pacific Command, and Daniel Russel, U.S. Assistant Secretary of State for East Asia and the Pacific, both voiced support last week for the Philippines' action in seeking a peaceful, lawful solution. The U.S. comments came after increasingly assertive moves by China in the South China Sea in recent weeks. "There is a growing concern that this pattern of behavior in the South China Sea reflects an incremental effort by China to assert control over the area contained in the so-called "nine-dash line," despite the objections of its neighbors and despite the lack of any explanation or apparent basis under international law regarding the scope of the claim itself," Russel said in testimony to a congressional sub-committee. The issue could also come up when Secretary of State John Kerry visits Beijing this week." This Policy Brief was originally published by the European Council on Foreign Relations. As China’s economic and military power increases, security in Asia looks set to find a new foundation. With trade integration on the continent growing through the implementation of “mega-FTAs”, relationships between Asian countries are becoming as important as US military guarantees in ensuring that Asia’s amorphous conflicts do not erupt into violence. The US military presence confirms the status quo in the region, but America has done little to resolve the continent’s territorial disputes. Even so, live conflicts are rare. China’s mixture of coercive action and self- control has enabled it to probe its neighbours’ weaknesses while avoiding open warfare. The European approach to Asia is out of step with the continent’s own trends. Asia is not interested in Western imports of multilateral security institutions and international arbitration, and the EU should abandon its efforts to transfer its own post-war solutions to the Asian situation. Instead, it should focus on rewarding compromise and build on its growing arms trade with the region to take a more central security role. As the US switches from a bilateral approach to a regional trade strategy, Europe should follow suit. It should create a value proposition of its own, to match the US-backed Trans Pacific Partnership. Otherwise, it risks losing its chance to increase its access to the region’s opening markets. When they think about Asia, Europeans often focus solely on China. On the one hand, they see it as an attractive economic juggernaut: European officials, media, and public opinion are increasingly concentrated on the economic opportunities and risks that China presents. On the other hand, however, they see it as a dragon blowing its hot breath on a powder keg that is close to explosion: Asia’s historical disputes, its national rivalries, and its territorial conflicts seem to be growing more serious. One thing is clear: China is on the rise. It has the largest market potential in Asia and also maintains by far the largest defence budget on the continent. But China must be viewed in its regional context, and in the region, economics are distinct from politics. Commercial integration among Asian economies is increasing, even without an institution like Europe’s single market. Meanwhile, the region’s fragile balance of power is based on historical grudges and rivalries – not all of which are focused on China. The only thing that keeps this precarious situation from erupting is the enduring pre-eminence of the United States as a naval power in the Pacific Ocean. "Ребята, вы чо? Я же с вами дружить хочу..."
"А мы чо? мы - ниччо... А ты чо? (!)" Europe and Asia have adopted opposite approaches to trade and security co-operation in the region. On trade and economic issues, Europe deals bilaterally with its Asian partners. It has not taken part in region-wide economic initiatives, such as the Asia-Pacific Economic Cooperation forum (APEC) or the Regional Comprehensive Economic Partnership (RCEP) free-trade agreement (FTA) negotiations. Even its negotiations on an FTA with the Association of Southeast Asian Nations (ASEAN) have been suspended. On security, Europe falls back on a well-worn dictum for the region as a whole, advocating a law-based multilateral system that mirrors, if not quite replicates, Europe’s post- war model. For its part, Asia has in the past relied for its security neither on the kind of multilateral framework put forward by Europe nor on other Western-derived legal tools. Instead, it has largely moved away from a multilateral approach to security. But, on trade and economic issues, it is moving towards a competitive multilateralism: the “spaghetti bowl” of bilateral agreements, which sidelined the World Trade Organization (WTO) and its Doha Round of trade talks, is now giving way to several concurrent regional initiatives. Europe’s outlook on the region also suffers from a kind of “G2” fixation. It tends to see China and the US as the only important movers in the Asian space, as if other stakeholders had been crowded out of a Pacific that is “large enough for two”, as President Xi Jinping told Barack Obama in June 2013. But what if Asia’s security were to be based on relations between Asian nation-states rather than on US guarantees? Observer Research Foundation Vice President Samir Saran has said that “in the next ten years, the movement and agency in the region will be run for the first time ever by Asia itself”. What if regional trade integration became a game with multiple players, shaped by a competing set of “mega- FTAs”? This commercial form of “minilateralism”, to use the jargon of political scientists, would not look much like the European ideal of collective security built on economic interdependence. And neither would it fit the bilateral approach to trade that Europe has taken since the failure of the WTO’s Doha Round. This brief will examine the dynamics of Asia’s security landscape and its linkages with economic trends, taking into account historical factors, the current rise of China, and the role of the US, which is still Asia’s most significant external partner. It will consider whether and how Europe can address Asia’s emergent conflicts. It concludes that a “Trans Eurasian Partnership” on trade and investment might be exactly the reset for which Europe and Asia should aim. Europe’s foreign policy and security approach to Asia, although it has given rise to plenty of meetings and statements, is largely underpowered and misdirected. Some EU member states have formulated foreign-policy positions on Asia and maintain security ties with the countries in the region. In spite of the Lisbon Treaty, the EU has far less control over foreign policy and security than it has over trade. So, true European capacity is split between the member states and the EU, with the result that neither the states nor the EU seem to have much control over guiding foreign policy and security. It is impossible to address the efficacy of the EU’s policy approach to security in Asia without attempting to understand the region’s underlying dynamics. The post-World War II order in the Asia-Pacific region is based on temporary solutions and suspended conflicts rather than on collective or co-operative security, or even on simple confidence-building measures. An American-backed peace has not contributed to a regional settlement on which all parties can agree. Even so, live conflicts in East Asia are scarce. The states in the region avoid taking serious risks that could lead to military action. And the protracted territorial conflicts in the region have more to do with symbolic competition than with the pursuit of any vital economic or strategic goal. National and ideological divides have in fact protected states and regimes that would have fallen apart if they had had to face a democratic peace or regional integration. The overall level of conflict in Asia remains minimal, in inverse relation to the explosion of military budgets and arms procurement across much of the continent. However, the massive military buildup, which includes the acquisition of long-range projection weaponry, has greatly increased the potential for incidents that could escalate into a sudden large-scale conflict. Russia has rejected a Chinese offer to cooperate on their separate territorial rows with Japan, a report said yesterday, as Prime Minister Shinzo Abe prepared to meet President Vladimir Putin in Sochi. Beijing said it would support Moscow in its decades-old dispute over the sovereignty of islands to the north of Japan in exchange for backing in its row about the ownership of an East China Sea archipelago, the Mainichi Shimbun reported. The report came just ahead of Abe's attendance at the opening ceremony of the Winter Olympics and a subsequent summit with Putin, at which they are expected to discuss the Russia-controlled Southern Kurils, which Japan claims as the Northern Territories. An increasingly close working relationship between Abe and Putin, who have already held four summits, has offered hope of progress, although Tokyo said it is unlikely to be settled in the near future. Just how close are Russia-China ties? The 2014 Winter Olympics will kick off in three days' time. As many will already know, the host city is Sochi, a subtropical resort city on Russia’s Black Sea coast. There are more controversies surrounding the Sochi Olympics than there are dolls in a Russian Matryoshka. The games have cost the country US$50 billion, US$7 billion more than China spent on the most expensive summer games ever in 2008. According to an investigative report released in December , fully US$26 billion of the cost of the Sochi Olympics consists of kickbacks and embezzlement. The spectre of terrorism looms large in a region separatists have long sought to turn into an Islamic caliphate. Russian anti-gay laws introduced last year made headlines worldwide. The games' alpine and Nordic events will be held near Sochi at Krasnaya Polyana, the site of the Imperial Russian Army's 19th century genocide against the Circassian peoples. 2014 is the 150th anniversary of the genocide. All in all, world leaders could be excused for not attending the opening ceremony, to be held on Friday. The US has already announced its delegation would not include the president, vice-president or first lady. The last time that happened was in 2000 (no word yet on what Sydney did wrong). One brave world leader venturing into the bear pit is Chinese President Xi Jinping. In an interview with Xinhua on 25 January, China's Ambassador to Russia Li Hui said Xi's visit shows the 'high level and uniqueness' of China-Russia ties. He added that China was a 'good neighbour, friend and partner of Russia', and that Xi would hold talks with Russian President Vladimir Putin during his stay in Sochi. Since the turn of the millennium, China and Russia have grown closer together as they have moved further away from the West. The two dominate the Shanghai Cooperation Organization, a Central Asian security and economic bloc seen as a counterweight to American interests in the region. China supported Russia's push for a political solution to the Syrian civil war in September. The countries held joint military exercises in the Sea of Japan last year, the largest naval drills China has ever conducted with another nation. Xi and Putin are said to enjoy a strong personal relationship. Xi's first foreign trip as president was to Russia; Sochi will be his first foreign trip this year. Xi was even present at Putin's 61st birthday celebrations at October's APEC Summit in Bali, and clapped along to an awkward rendition of 'Happy Birthday'. So on the surface, Sino-Russian relations appear friendly. The countries have a shared interest in redesigning the post-Cold War global political architecture to reflect a multipolar distribution of power. Both regimes find other countries' 'meddling' in their internal affairs reprehensible, and derive prestige from touting their partnership to the world. Complementarities in industry drive bilateral trade. But look a little closer and the friendship isn't so clear-cut. 'Pragmatic alignment' is a more apt phrase to describe the relationship than 'friendship'. For instance, China has a long history of pilfering Russian defence technology, a fact in which Russia's military press periodically indulges. Far East Russians also worry that increasing economic integration with China will turn their prime piece of Pacific real estate into a de facto Chinese province. Much of the Far East's fresh produce is already grown on Chinese-run farms, both in China and Russia. Last year saw the consummation of a slew of deals to transfer the Siberian resources south. One deal saw Rosneft agree to supply China National Petroleum Corporation with 365 million tons of oil over 25 years, worth US$270 billion. Yet China is frustrated by Russian demands that the Siberian deals reflect European prices. At the end of January Gazprom again failed to seal a 30-year natural gas supply accord with China. Negotiations have been dragging on for 15 years. These issues have been a thorn in the side of Sino-Russian relations for years. But heading into 2014, there are signs of further strain in Central Asia. Traditionally a Russian sphere of influence, China is outcompeting its northern neighbour in the race for the region's abundant natural resources. China is already the largest trade partner of four of the region's five countries. In 2012 China’s trade volume with Central Asia was 100 times what it was when the countries' achieved independence from the Soviet Union. Russia eventually acquiesced to the bank proposal, but issues remain in the SCO. China sees value in strategic relationships with the 'Stans' in its fight against Uyghur nationalists, who demand independence for Xinjiang, a Chinese autonomous region that borders three SCO members. SCO military exercises have thus focused on putting down separatists and terrorists. For Russia the separatist issue is more peripheral in Central Asia. China needed Russia when the SCO was founded 2001. But now it is clear the SCO was always a vessel for the projection of Chinese economic and strategic interests into Central Asia. As Russia’s increasing irrelevance to the region it once dominated becomes clearer to the leadership in Moscow, there may be ramifications for the bilateral relationship. The fallout will be contained in public; the two derive much benefit from presenting a united front on the world stage. In private, however, disagreements will likely multiply. Photo courtesy of REUTERS/Alexander Nemenov. , . . ' ' . ' , . 2014 , , . ' , - ' . , , , . , , . 5 3 16 , . , . . . " ," . " , , ." ' " " ' " " , . , , , . ' , , . , , , . , ' , . 《中俄关系：冬天里的暖意》, : ' , : , ' . History has largely been kind to Alexander II, the Russian czar who freed the serfs in 1861, just two years before Abraham Lincoln issued the Emancipation Proclamation in 1863 (the two world leaders even corresponded about their plans). Modern historians refer to him as the "Czar-Liberator" and compare him to Mikhail Gorbachev for his willingness to engage with the West and reform Russia. But on the occasion of the 2014 Winter Olympics being held in Sochi and the surrounding areas, it's helpful to look back and remember that 600,000 locals died from starvation, exposure, drowning and massacres in a concerted campaign by the Russian Empire to expel the Circassian people, as they were called, from the region. The Circassians and the other inhabitants of the Caucasus region did not fit into the Czar's reform program, because he viewed them as an inherent risk to the security of Russia's southern frontier . . .
On March 1, 1881, Alexander II was killed when a bomb was thrown into his carriage by a member of the People's Will revolutionary organization. Neither the abolition of serfdom nor the expulsion of the Circassian people stabilized the Russian Empire. The Romanov dynasty outlived Alexander II by less than forty years, collapsing during the reign of his grandson, Nicholas II in 1917. Alexander II's expulsion of the Circassian people in 1864 continues to shape Russia's relationship with its Central Asian borderlands today. One hundred fifty years later, Russian President Vladimir Putin is once again concerned with security in the Caucasus. Putin has increased security for the Olympicsfollowing twin bomb attacks in Volgograd last December. The continuing insurgency in north Chechnya demonstrates that Russia still has not reached a lasting, peaceful settlement with the stateless peoples along the nation's southern border. Stability will not come to the Caucasus until Russia comes to terms with its violent past. And then my debit card did not work. This wasn’t just any card; it was a Citibank gold card, the kind that warrants a special line at the bank’s offices and obsequiousness from the tellers. And it was linked to the account that, for the moment, held all my money: We had sold our apartment in Moscow, jumped through an assortment of Russian tax hoops and transferred the proceeds to the United States, where we now lived. It made me nervous to have all that money sitting in one virtual clump in the bank — but not nearly as nervous as having the card connected to it not work. The experience was also humiliating. In one moment, I had gone from being a Citigold client to a deadbeat immigrant who couldn’t pay for her son’s diapers. I called Citibank as soon as I got home. “Your account has been closed,” a woman informed me, without a hint of that special precious-metal politeness. “When? Who closed it?” I was working hard not to sound belligerent. “And where is my money?” I could hear the woman tapping on her keyboard indifferently, as she was figuring out where all the money I had in the world was. I whispered to my partner that the account had been closed and the money was gone. “It’s the Russian tax police,” she whispered back. That made perfect sense. As a journalist I had investigated similar scams perpetrated by the Russian tax police on a far grander scale. And I had reported this transfer, including the amount and all the account details, to the Russian tax authorities. Except that it wasn’t the Russian tax police that had closed my accounts (there were two). It was Citibank. “I see that because your transactions indicated there may be an attempt to avoid complying with currency regulations, Citibank has closed your account,” the woman informed me. There was now a distinct note of steel in her voice. “A cashier’s check for the full amount of money contained in your accounts has been sent,” the woman said. “The cashier’s check will serve as your notice.” Citibank had fired me as a client. For several nerve-racking days my nest egg, my children’s future college tuition — every penny I had — resided in a cashier’s check that was wending its way through the United States Postal Service. It finally arrived with a terse note informing me that I had been told “in a previous letter” that Citibank could no longer have me as a client. I had gotten no previous letter, and this one came from the Client Escalation Unit — about as far from the grace of gold-card status as a customer can fall. I wasn’t entirely surprised. This had happened to other Russian-Americans I know, including one of my closest friends and my father. My friend had opened her account at a local bank in the United States when she got her first job, at age 13. Her accounts were summarily closed in 2008, while she was working in Russia. The bank, which had been bought by Sovereign in the meantime, would not state a reason for firing a client of 27 years. My father, who immigrated to the United States in 1981, had his accounts closed by BankBoston in 2000, when he was a partner in a Moscow-based business. His lawyers pressed the bank on the issue and were eventually told that because Russians had been known to launder money, the bank applied “heightened scrutiny” to accounts that had a Russia connection. It had closed “many” accounts because of what it considered suspicious activity. Like other kinds of ethnic profiling, these policies of weeding out Russian-Americans who have money are hardly efficient. Russians who launder money don’t do it by transferring large amounts between personal accounts opened in the same name and in plain view of all the relevant authorities. They channel the money through businesses registered in offshore zones, usually under names culled from pop songs or romantic comedies. When I took my cashier’s check to a new bank, I felt trepidation and made sure to say nothing about Russia. I got a platinum card. The Reagan administration's 1987 Intermediate-range Nuclear Forces Treaty is celebrated as the "cornerstone" of nuclear arms control. But Moscow has openly flouted the spirit and apparently the letter of the INF Treaty at least since 2008, signaling that it is determined to regain some of its Cold War nuclear-strike capacity. The INF agreement went where no other nuclear-arms treaty had gone before. Instead of simply limiting weapons numbers, it eliminated the entire class of U.S. and Soviet intermediate range—500 to 5,500 kilometers (or 310 to 3,400 miles)—ground-launched ballistic and cruise missiles. The agreement also prohibited their testing, production, possession or deployment. The treaty bans missiles with even the potential for use as intermediate-range weapons, such as the ones with which Russia might target countries in Europe and Asia. In 1992, the Russian Federation formally recommitted to the treaty after the demise of the Soviet Union. Although Russia has been ignoring the INF Treaty for years—if Russian news reports are any guide—the Obama administration only recently felt compelled to openly take note of what's going on. TheNew York Times NYT +0.42% New York Times Co. Cl A U.S.: NYSE $14.32 +0.06 +0.42% Feb. 12, 2014 10:39 am Volume (Delayed 15m) : 113,085 P/E Ratio 57.66 Market Cap $2.14 Billion Dividend Yield 1.12% Rev. per Employee $294,095 14.5014.4014.3014.2010a11a12p1p2p3p 02/06/14Advertising Declines Weigh On ... 02/06/14 Digital-Ad Sales Slip at New Y... 01/30/14 Another New York Times Reporte... More quote details and news » NYT in Your Value Your Change Short positionreported on Jan. 29 that, "The United States informed its NATO allies this month that Russia had tested a new ground-launched cruise missile, raising concerns about Moscow's compliance with" the INF Treaty. The report said the administration began raising questions with Russian officials last May but was rebuffed. Why is this news? The U.S. has sophisticated technical means by which to monitor and verify arms agreements. But in this case the administration could have pursued Moscow's compliance issue years ago by simply reading the multiple Russian press accounts of a ground-launched cruise missile called the R-500. This stream of commentary, including reporting by the official Russian news agency RIA Novosti, indicates a clear INF Treaty violation: Russia has tested and produced a ground-launched cruise missile with a prohibited range potential of between 310 and 3,400 miles. Russia announced the first test launch of the R-500 in mid-2007 without referring to its precise range. 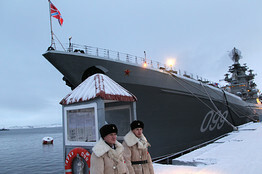 But in November 2008 RIA Novosti revealed that the potential range of the R-500 "can exceed 2,000 kilometers," or 1,243 miles—a range squarely within the 310 to 3,400 mile range the treaty forbids. From 2008 through December 2013, major Russian publications reported that the R-500's range is between 620 and 1,864 miles, and that the missile is in serial production. Another compliance problem is a missile called the RS-26. In 2011, Russian officials declared the RS-26 to be an intercontinental ballistic missile, which by definition has a range beyond 3,418 miles and so wouldn't be subject to the INF Treaty. According to reports posted on the Russian defense ministry's own website, however, the RS-26 has been tested twice to a range of approximately 1,245 miles. That would make it, at best, a circumvention of the treaty. There is also Russia's nuclear-capable Iskander M ground-launched semi-ballistic missile. According to a Sept. 26, 2011, Izvestia report, it has a range of up to 372 miles. Violating or skirting arms treaties is not new for Moscow. In the years before the Obama administration, official U.S. treaty-compliance reports documented frequent Russian misbehavior, including violations of the Anti-Ballistic Missile Treaty, the Biological Weapons Convention, the Chemical Weapons Convention, the Limited Test Ban Treaty, SALT I, SALT II and START I. Since 2009, the current administration's unclassified arms-control compliance reports to Congress have been mum on Russian INF Treaty noncompliance. The most recent report in July 2013 stated that the U.S. had raised no INF compliance issues with Russia in the past year. The unclassified compliance reports in 2011 and 2012 said the same. These Russian actions demonstrate the importance the Kremlin attaches to its new nuclear-strike capabilities. They also show how little importance the Putin regime attaches to complying with agreements that interfere with those capabilities. Russia not only seems intent on creating new nuclear- and conventional-strike capabilities against U.S. allies and friends. It has made explicit threats against some of them in recent years. For example, Russia's Interfax news agency reported in 2008 that while discussing the targeting of Russian nuclear weapons, Russian Defense Ministry spokesman Gen. Anatoly Nogovitsyn, stated, "Poland is making itself a target. This is 100 percent [certain]. It becomes a target for attack. Such targets are destroyed as a first priority." Some allies and friends, such as South Korea and Japan, are already deeply concerned about the credibility of the U.S. nuclear deterrent in the context of these growing nuclear threats and the U.S. push for further deep reductions in its own nuclear arsenal. A recent report by the Japanese defense ministry's policy-research arm observes that with "further progress in nuclear disarmament by the United States . . . U.S. allies will inevitably feel less confident in the U.S. nuclear umbrella. Much less confident in the case of Japan." The growth of Russian nuclear capabilities in violation of the INF Treaty will add pressure on these countries to accommodate Russia at U.S. expense or to seek alternative capabilities, including rethinking their nonnuclear status. It is questionable whether the Senate would have approved the 2010 New START treaty had Russian noncompliance with the INF Treaty been aired at the time. Soft-peddling Russian misbehavior avoids immediate friction, but further nuclear accords will be meaningless, even dangerous, if the U.S. doesn't enforce compliance. Mr. Payne is the director of the Graduate School of Defense and Strategic Studies, Missouri State University (Washington-area campus) and a former deputy assistant secretary of defense. Mr. Schneider is a senior analyst at the National Institute for Public Policy and a former senior official in the Defense Department. WASHINGTON — The director of national intelligence acknowledged Tuesday that nearly a year after the contractor Edward J. Snowden “scraped” highly classified documents from the National Security Agency’s networks, the technology was not yet fully in place to prevent another insider from stealing top-secret data on a similarly large scale. The director, James R. Clapper Jr., testifying before the Senate Armed Services Committee, said Mr. Snowden had taken advantage of a “perfect storm” of security lapses. He also suggested that as a highly trained systems administrator working for Booz Allen Hamilton, which provides computer services to the agency, Mr. Snowden knew how to evade the protections in place. But Mr. Clapper confirmed the outlines of a New York Times report that the former N.S.A. contractor had used a web crawler, a commonly available piece of software, to sweep up a huge trove of documents. Mr. Clapper also said, for the first time, that some of the information Mr. Snowden is believed to possess could expose the identities of undercover American operatives as well as foreigners who have been recruited by United States spy agencies. The information Mr. Snowden has released so far through several newspapers and a new digital news organization that began publishing on Monday has not revealed the names of agents or operatives, and it is unclear how much of that information he took with him when he fled the United States. He is now in Russia. Under questioning, Mr. Clapper made clear that while the N.S.A. has installed security upgrades, not all locations have the software and warning systems that could detect mass downloads of information. He did not address why the agency was not able to detect the web crawler, which indexed and copied all the data in its path. He said it was likely Mr. Snowden would have been caught if he had been taking the information from inside N.S.A. headquarters at Fort Meade, Md., instead of at an outpost in Hawaii. “We are going to proliferate deployment of auditing and monitoring capabilities to enhance our insider threat detection,” he said. Such systems have already been widely used at some intelligence agencies, including the C.I.A., officials said. The continuing revelations have posed a particular challenge to Mr. Clapper, a retired Air Force general and longtime intelligence expert, who has made no secret of his dislike for testifying in public. Critics have charged that he deliberately misled Congress and the public last year when asked if the intelligence agencies collected information on domestic communications. He was forced by the Snowden revelations to correct his statements, and he has been somewhat more careful in his testimony. “Our whole system is based on personal trust,” he continued. Over the long term, Mr. Clapper said, all 16 of the nation’s intelligence agencies will put a complex system in place that is intended to tag every piece of information in their databases, and then tag who accesses it. That would allow a kind of real-time monitoring missing when Mr. Snowden was freely moving through the N.S.A. system. The agency has imposed other rules intended to sharply restrict the sharing and downloading of top-secret material. First is a “two-man rule” — based on the model of how nuclear weapons are handled — that requires two computer systems administrators to work simultaneously when they are inside systems that contain highly classified material. At Tuesday’s hearing, Mr. Clapper and Lt. Gen. Michael T. Flynn, the director of the Defense Intelligence Agency, also disclosed that American analysts believe that Iran will be ready to test an intercontinental ballistic missile by next year, a crucial milestone in the country’s military program. It will still be an undetermined amount of time before Iran will be able to perfect the important next step of designing and miniaturizing a nuclear weapon to fit atop a long-range missile, Mr. Clapper said.